Being a knitter certainly comes with its perks….like the ability to create the most adorable fruity summer outfits for new babies. 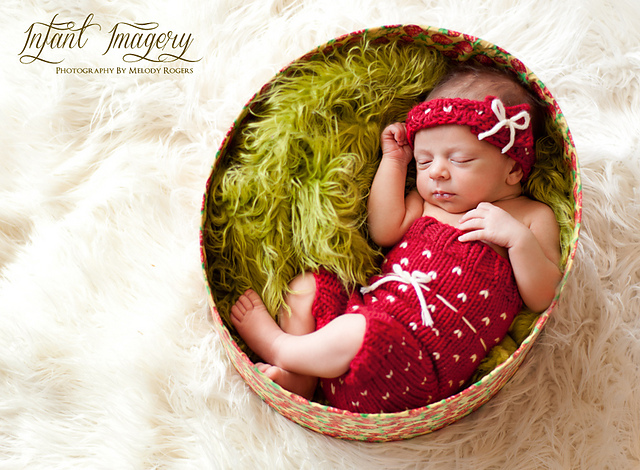 This knit baby shorts set is cute in solid colors….but dress it up like a strawberry and you’re sure to win. 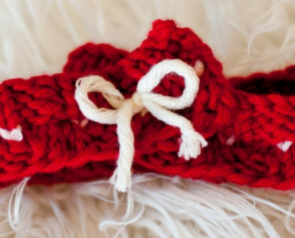 This free knit baby pattern features bulky (5) yarn and size 6.0mm (US10) knitting needles. Repeat rounds 9-16 until your piece measures approx. 9.5” (24.25cm) long from the cast on edge. End on a repeat of round 10. Knit 24 stitches, and place the other 24 stitches on a stitch holder. Join the first 24 stitches in the round and place stitch marker. Cut yarn and weave in ends. Using your yarn tail from earlier on and your yarn needle, seam up the crotch section as needed. Use your yarn needle and white yarn to put a strand through the middle section without “seeds”. I took my yarn in and out of one stitch with three sts in between. Tie a bow in the middle front. Overlap the ends approx. 2 inches at an angle as pictured, and seam them together. Then add a white bow over the overlap. See picture 2. Repeat rounds 9-16 until your piece measures approx. 10” (25.5cm) long from the cast on edge. End on a repeat of round 10. Knit 26 stitches, and place the other 26 stitches on a stitch holder. Join the first 26 stitches in the round and place stitch marker. Repeat rounds 9-16 until your piece measures approx. 11” (28cm) long from the cast on edge. End on a repeat of round 10. Knit 30 stitches, and place the other 30 stitches on a stitch holder. Join the first 30 stitches in the round and place stitch marker. Repeat rounds 9-16 until your piece measures approx. 12” (30.5cm) long from the cast on edge. End on a repeat of round 10. Knit 34 stitches, and place the other 34 stitches on a stitch holder. Join the first 34 stitches in the round and place stitch marker. Repeat rounds 9-16 until your piece measures approx. 13” (33cm) long from the cast on edge. End on a repeat of round 10. 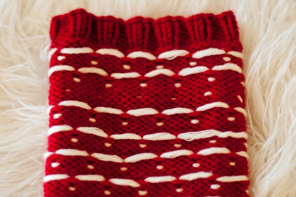 Knit 36 stitches, and place the other 36 stitches on a stitch holder. Join the first 36 stitches in the round and place stitch marker. Photo 2 – Example of how to overlap headband by 2 inches at an angle.